The big crypto sell-off has continued this weekend as red Sunday sees Bitcoin fall to its lowest level this year. A big psychological barrier was broken a couple of hours ago when Bitcoin plunged below $6,000 for the first time in 2018. Analytics website coinmarketcap.com is reporting a 3.7% fall on the day for Bitcoin which has dropped its price to $5,900 at the time of writing. Almost $3 billion was wiped out from its market cap in just two hours. Currently BTC market cap is just over $100 billion, also its lowest level this year. The previous low point for Bitcoin this year was on February 6 when it dropped to $6,170. The last time Bitcoin was trading below $6k was in October 2017 however markets were largely bullish back then. Analysts have been predicting a fall to around $5k but that has now been revised lower as there is a real possibility of Bitcoin going back to mid-2017 price levels. As has been witnessed countless times all of the other cryptocurrencies have been dragged down with it, many even further suffering big losses in double figure percentages. Ethereum is at its lowest level since April 7 when it dropped to a yearly low of just below $370. At the moment Ether is down 5.3% on the day to $442, back to trading levels in early December. The two biggest losers of the day have been EOS and Ontology. The EOS mainnet launch did not quite go as well as planned with several issues resulting in the questioning of its decentralization, or lack of it. Currently EOS has lost 12.7% in 24 hours and is trading at $7.35 according to CMC. Likewise Ontology has taken a big hit and dropped 15% to $4.36 on the day. New comers Populous, Zilliqa and Aeternity are all down by over 14% since yesterday. All other altcoins are also falling fast and many of them are reaching price levels not seen since late 2017. The total capitalization for all digital tokens is at its lowest point of the year right now. Falling to $242 billion markets have lost 14%, or $40 billion, since last weekend. 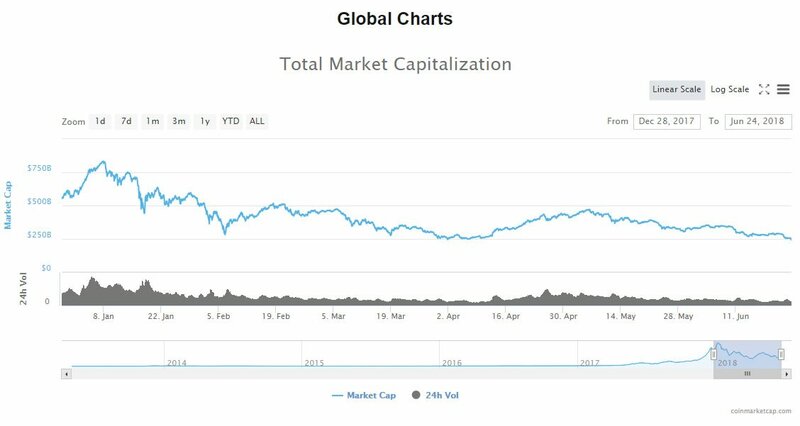 Over the past month almost $100 billion has left the crypto scene and markets have plunged over 27%. We are now in the third dip of the year, and the deepest so far. The big question remains; are we at the bottom yet?